The Old Bellstrom Gaol crouched above the fine city of Airenchester like a black spider on a heap of spoils. It presided over The Steps, a ramshackle pile of cramped yards and tenements teeming about rambling stairs, and glared across the River Pentlow towards Battens Hill, where the sombre courts and city halls stood. From Cracksheart Hill, the Bellstrom loomed on every prospect and was glimpsed at the end of every lane. 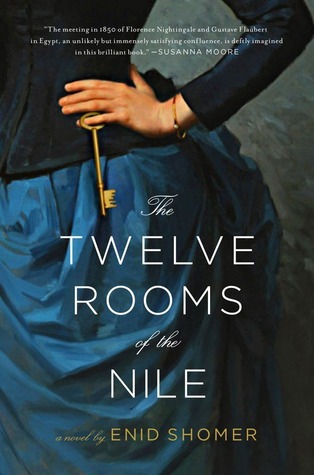 I just finished The Twelve Rooms of the Nile, a novel about the imagined meeting of Florence Nightingale and Gustave Flaubert when they both traveled the fabled river–before they became famous. It’s a lovely literary effort with wonderful insights into two intriguing characters. I’m pleased to host a guest post by the author Enid Shomer where she tells us how she came to know both these remarkable people and write about them. Ms. Shomer’s short fiction and poetry has appeared in The New Yorker, The Atlantic and The Paris Review among other publications. This is her first novel. Thanks to her publisher Simon and Schuster for providing two copies of this book for a giveaway (details at the end of the post.) If you want to learn more about Ms. Shomer and her writing, please visit her website. Enjoy!